A pair of high quality men's snow boots is an essential part of any man's winter wardrobe. Without them, he may find himself at a complete loss in the midst of a snowstorm or even mildly treacherous weather. Fortunately, a great pair of snow boots is quite easy to find. Snow boots are all about function. In most parts of the world, it would be impossible to leave the house without a decent pair once winter weather hits. A snow boot isn't just a hefty boot worn during cold weather, though. First and foremost, it is designed to keep the feet warm in even the most challenging weather conditions. They are ideal for individuals who spend plenty of time outdoors during the snowy season, and especially for those who deal with harsh winters on a regular basis. Sturdy materials: All snow boots are built to perform, and thus are constructed of hardy, durable materials that can withstand just about anything the weather throws at them. Popular materials include nylon, leather and rubber. Insulation: A boot without insulation is not a snow boot. Insulation traps warm air inside the shoe and keeps your feet toasty at all times. Most modern boots are designed with lightweight insulation that provides all the warmth of a thicker material, yet without any added bulk. Boots with a higher gram of insulation will keep your feet warmer. Water resistant: Not all boots are completely waterproof, but they should, at the very least, be water resistant. A waterproof boot, however, can be completely submerged into water and still keep your feet dry. A water-resistant boot, on the other hand, does not have a sealed seam around the opening. Thus, the potential for moisture to enter the boot does exist. Thick soles: A decent snow boot should feature a sturdy rubber sole. Many men's styles feature molding, which "grips" the ground and provides extra traction to prevent slippage. Height: Snow boots are not short. They should be tall enough to protect your pants from moisture. Men's styles may extend well above the ankle and, in some cases, to mid-calf length. Worn with a pair of insulated, weatherproof pants, your feet and legs will both be completely protected from moisture. Wet, snowy, and extremely colrd conditions all call for wearing snow boots. Men may also want to wear a pair when skiing and snowboarding, or even when just walking around the lodge on a winter vacation. If the threat of snow exists but the white stuff hasn't started falling yet, you might consider leaving a pair in your car just in case. This is primarily a good idea if you're far away from shelter or driving on a potentially snowy day. Columbia: The highly regarded sportswear company offers a modest range of cold weather boots for men. Utilizing a variety of different technologies, these boots are built to withstand difficult weather conditions. The Omni-Grip range provides extra traction; the Omni-Heat range offers extra thermal protection; and the Omni-Tech range is completely waterproof and breathable. 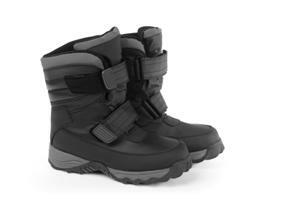 Kamik: Kamik's boots are designed with the harshest possible conditions in mind. High-performance features, like "locking" snow collars that keep moisture at bay, removable liners, light-reflective accents and foam layers for added warmth make these boots especially attractive to avid snow travelers. Sorel: Fine craftsmanship is the cornerstone of every pair of Sorel boots. Details like shearling cuffs, removable "inner boots" and extremely thick soles lend these snow boots extreme appeal. Note that some of these boots are definite investment pieces (the Caribou Stingray, for example, retails for $800), but they are well worth the expense if you spend plenty of time in the snow. Remember that your snow boots should fit like a dream. Spare no effort in finding a pair that is as comfortable as possible. Wear them with the socks you plan to wear in the snow, so that you get an accurate idea of how your boots will feel when you're walking in them. With the right boots on your feet, you can enjoy that winter weather without fear.